Almost a year after their broadcast ad was rejected by all three major networks - ABC, NBC and CBS - as too controversial the United Church of Christ has won the Association of National Advertisers Annual Award for Multicultural Excellence for its gay and minority-inclusive "Bouncers" ad and The Initiative campaign. The ad was created by Gotham NY ad agency. The award "recognizes the efforts of a corporate marketer for an outstanding multicultural advertising campaign" among all major corporate advertisers, from Coca Cola to General Motors, nationally and internationally. Honda paid New York State $45,000 for rights to use the "I Love New York" logo in a Honda Accord commercial. In the commercial, the Accord is seen nudging the heart aside and taking its place. Some say this is sacrilegious to the slogan which was created by Bobby Zarem and designed by Milton Glaser in 1978. Others say it's just business as usual. We say New York is stupid for selling out. Any campaign that's been running for 27 years must be doing something right, not to mention the slogan becoming part of culture. To sell it for a measly $45,000 is a joke. And, worse, for a throw away ad campaign. Zarem says, "All anybody is interested in is making a buck. It's cheap and stupid." Conversely, Glaser thinks it's OK telling the New York Daily News, "The state has the rights to it, but I'm happy with it. Basically, I love to influence the time I am in, and when you see something like this it's very flattering." New York's Ad Store has launched a new campaign for Piaggio USA's Vespa scooters. 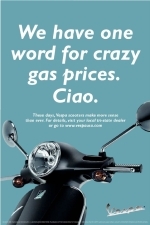 The campaign consists of outdoor ads which explain the merits of owning a Vespa when gas prices are sky high. Ad headlines include "Relieves Gas Pains", "When in New York, do as the Romans do", and "Don't be a gas-hole." See all the creative here. John from random Culture points us to some work his agency, Click Here, did for Kiwi show polish. To get across the point of how "crazy fast" Kiwi's Express polish is, a Kiwi bird, in the first of a series of three videos, is shout from a cannon (Outpost anyone?) and proceeds to fly through various scenescapes until the spot ends with a voiceover and the tagline, "Look Sharp." Mundane as shoe polish is, this at least attempts to add some fun to the product.